We had 4 GMs this week and 18 players in the next to last NY Masters of the season. We had a new player this week, as Eric Cooke is back in New York after a long absence. He has been playing chess in Hungary in the First Saturday Events, so it will be interesting to see where his chess is after such adventures. Also back was qualifier Alex Lenderman, who rained havoc on the tournament two weeks ago, by beating two masters in his first two rounds. One more good result from Lenderman and we could have a new master on our hands! In Round 1 we had a few upsets. Alan Stein is clearly improving his chess, as he managed to draw with the qualifier Alex Lenderman. Two weeks ago Stein was defeated by Lenderman, albeit after achieving a totally won position and botching it in serious time trouble. Meanwhile I was unable to defeat Manthan Chokshi. I had quite a bad position out of the opening and was probably lost somewhere in the time scramble, but usually play in such situations is less than perfect, and thus a bishops of opposite ending was reached and a draw was agreed. Leonid Yudasin versus Lev Milman was the live internet game, last time Milman played in the NY Masters he defeated his first ever GM, not to mention he also had the black pieces. Would he be able to do it again this week? There is an adage that young players don’t know the fundamentals of the endgame, yet it seems that Milman is too well versed in such theories. Notice how he remembers the advice “In the endgame your king is well placed in the center”. 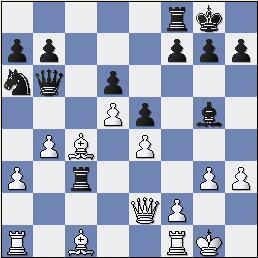 Unfortunately this position could be classified more as a late middlegame. I’m sure every single move for the next 15 moves, Lev considered resigns as one of his options. However it’s always tempting to convince yourself to play one more move. Unfortunately for Lev, Yudasin is quite adept at endgames with 3 extra pawns. We looked like we would have some surprises in the 2nd round as Jay Bonin seemed versed to finally end the curse of Stripunsky. Bonin has lost to Stripunsky many times in a row, but this week had a position which seemed to be quite winning. In the end Stripunsky swindled him to win a pawn in an endgame, but Bonin swindled Stripunsky back in the time scramble to achieve a drawn position. However at this moment Stripunsky looked to his left and noticed that Bonin’s flag had fallen. Lenderman continued his torrid pace by knocking off IM Justin Sarkar. Sarkar seemed to have a winning position, with an extra exchange, but Lenderman is very tricky and fast, and pulled out the victory. We showed the Lapshun battle because of his penchant for strange wild positions, however this game has been a real snorer so far. It looks like massive trades on the c file will occur and then a draw will be reached. 2 Yudasin – G.Shahade GAME BELOW! White has a clear plan of playing d4 in this position. One always wonders whether you should simply allow white to play d4, and react in the center afterwards, or make some kind of drastic measure to stop it. After white plays d4, black has some problems in that the c8-bishop is quite weak. If black tries to respond as follows... 7. 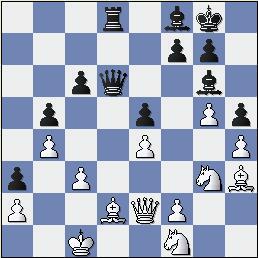 ...0-0 8.d4 cd4 9.cd4 d5 10. e5 Ne4…after a move like 11.Nc3, white will have an EXTREMELY strong bishop to be placed on the b1-h7 diagonal to aid in an attack against the black king. 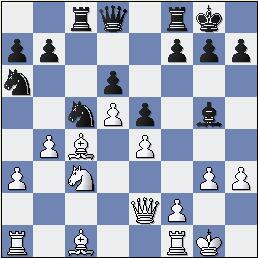 Meanwhile black’s counterpart on c8 is severely weakened because of the pawns on d5 and e6, being on the same color as the bishop. Because of this, Yudasin suggested 7. 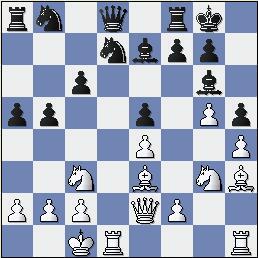 ... e5 as an improvement, thus achieving a Closed Ruy Lopez type of position, except with the moves a6 and b5 played on the queenside. The exclusion of these moves may even favour black and thus the position is in Yudasins word “A chess position”. 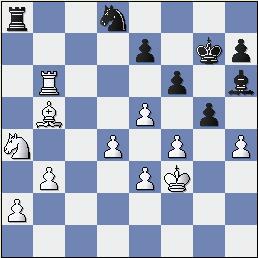 Unfortunately I was too embarrassed to play e5 after playing e6 a few moves before, however it makes enough sense since white has wasted some tempi with the light squared bishop. Not the best place for the knight. 13. ... Nd7 would have been more prudent. 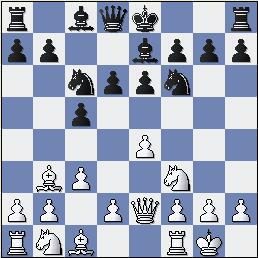 14.Qe2 Nd7 15.g3 Ndc5 16.Bc4 Rc8 17.a3 Bg5 18.b4? 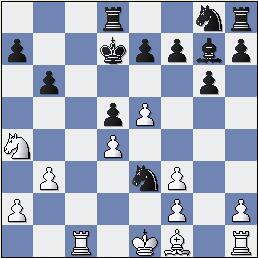 Despite white’s previous oversight, white still has the advantage, in large part due to the inactive knight on a6. If 20. ... Bc1 21.Rac1 Rc1 22. 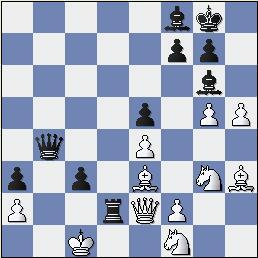 Rc1 Qc7, white simply plays 23.Rc2 to escape the pin, and has an advantage, once again due to the terrible knight on a6. 21. ... Qxc4 allows simply 22.Qxc4 Rxc4 23. Be7 Re8 24.Bxd6 Rxe4 and after 25.Rfd1 or even 25.b5 Nb8 26. Rac1, white is clearly better. 21. ... Rxc4 allows 22.Rac1 Rfc8 23.Rxc4 Qxc4 24. Rc1!, winning instantly. Haha, I am threatening to take on g3, what will Yudasin ever do? He can simply ignore me. After 21. ... Rxg3 22. Kh2 my rook is trapped and I am lost. After 21.Bb2 all hope is lost. It’s quite sad because I really felt confident after Yudasin overlooked …Nb3, however I had to bear down and work very hard at that moment to save the game, instead of basking in my glory. 3 Bonin – Ashley SEE GAME! Alan Stein must have been pretty surprised to have Novikov offer him a draw on move five. Alan told me after the game that he considered not accepting, but then said “but how much am I really going to learn from just one game?” This mass drawing gave Bonin and Ashley the chance for a backdoor victory, as the winner of that game would split first place. Meanwhile on the lower boards, I won a pawn out of the opening and expected a simple win against Lenderman. Probably I shouldn’t have allowed him to checkmate me. This win by Lenderman, which was achieved by a typical KID rook sacrifice, means he goes down in the recordbooks. His qualifier score of 2.5/4 ties the all time high qualifier score of Jonathan Corbblah. After this performance it’s even possible that Lenderman has already achieved the 2200 rating! This is a huge game for both Jay and Maurice. Jay would love to tie for first for the second time in his NY Masters career. Meanwhile Maurice has yet to win money in this event, could he get the monkey off his back? You know Maurice had to be reeling going into this game, as his beloved New York Giants were THRASHED by the Super Bowl favorites, the Philadelphia Eagles. Let’s see if he could recover from such emotional torment…. Reminiscent of the game Morphy versus the Duke of Brunswick and the Count of Isouard. 17. ... Nxd7 18.Rd1 a4 19.Rxd7 Qa5! 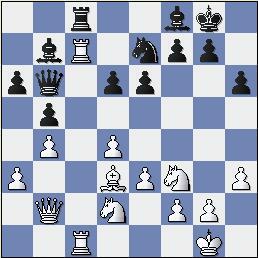 Amazing that Maurice can get away with this move, however it much superior to passive moves like Qe8, which hold on to the e7 bishop. White’s advantage is actually not so clear if he should take the third piece. With the move Nd1, white should have a winning position. It’s just a matter of solidifying the position and stopping blacks counterplay. Counterplay not stopped, whites pieces have somehow gone astray and black gets a big attack. 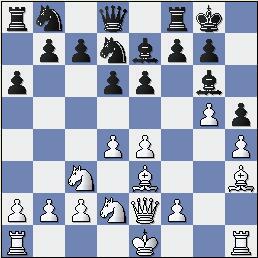 35.bxc5 Qxc5 36.Nxh5 b4 37.Nhg3 bxc3 38.Be3 Qb4 39.h5 Rd2?! The ?! may be a bit unfair as this move practically wins on the spot. However 39. ... c2 was basically checkmate in two moves. Some commentators watching the game online, called this position the battle of the famous “Bonin Knights” versus the “Ashley queens”. However this really isn’t a battle anymore, Jay finished the game out of inertia and because Maurice was under 2 minutes on the clock.